At last, I have opened my curtains and emerged, blinking, in the daylight. I work in my bedroom at a desk next to a large sliding glass door, and if the curtains are open, all I see is glare. Bright light! Bright light! (I’m also like a Gremlin in that I cannot eat after midnight). Anyway, my point is, I am done with the next book, and have sent the requested edits to my editor. There may be one more round, but it shouldn’t be substantial (knock on wood). Oh, also, the book’s title will be, QUEEN OF SHOW instead of ROSE OF GALILEE. Queen of Show refers to the big prize at a rose show. The best of the best, which my character the amateur rose breeder is trying to attain. I love how it turned out. This is a rare thing for me to say, to not be filled with a stomach-clenching mix of relief and insecurity. But when I re-read it, I actually enjoyed it, as if I hadn’t written it. Generally when I re-read something I wrote, I cringe and hide my face as I mark it up. This book’s whole process was a complete departure for me in every way, so I thought I’d do a little post-mortem to analyze what happened. For instance, writing the first full draft took maybe 6 weeks. Not too surprising, except that this draft didn’t need many changes. Just a lot of cutting, and some clarification. How in the name of all that is good and holy did I do that? Housewife took YEARS to write. Years! Of course, I didn’t know what I was doing then, either. And yes, I did write a novel while in Hawaii (about the ghosts and the cupcakes) that is currently in my drawer, so I did get some extra practice (I still love that novel, but the timing isn’t right for it yet). But that novel took several drafts and about five months of work, too. So now I’m trying to figure out how I managed to write so quickly. What am I doing differently? I guess the real answer is the entire process was longer than six weeks. Let me talk about how I wrote the novel. Summer, 2010: I consider writing a novel about an amateur rose breeder. I begin research about roses and find a rose breeder to talk to. I read a lot of articles. October, 2010: I write the outline for my editor. October 2010: We move from Hawaii back to San Diego. I only write the opening, because my computer breaks, and I have no desk, and I’m frankly too traumatized to do much of anything. Instead, I talk a lot with my sister-in-law, who’s had 3 kidney transplants and who inspired the main character, Gal. Serendipitously, she has moved back to San Diego at the same time we did, so it feels like this book is MEANT TO BE. January: I show my editor the first 70 pages. I’ve written maybe 100, and those feel like agony. She tells me I have too much exposition, and I need to spread out the info better. January-late Feb: I write the rest of the book. This time, it’s not painful. The story has gelled on some level of my brain, and it just wants to come out. This time, it really is like giving birth. 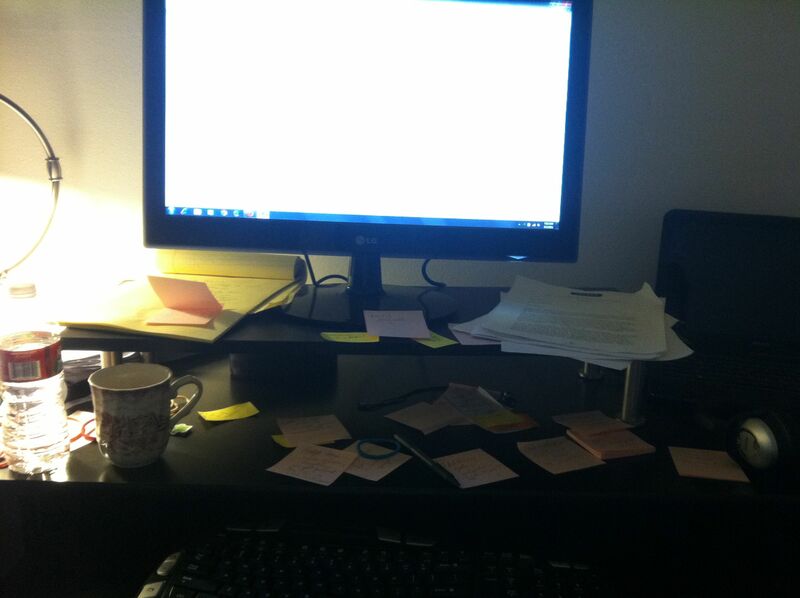 I write every day until the kids get home, only taking breaks when I have physical pain. I even write on the weekends, because otherwise I lose my rhythm. Also, I must admit, my sense of urgency stems not just from creative inspiration, but from the fact I would someday like to earn a good living at this. A product must be produced. Feb- March: I re-read the novel, make notes, and make changes. To my surprise, it’s pretty solid. Early March: I send it to my editor. Her suggestions are more for clarification, not structure (new for me). It turned out to be 427 pages. 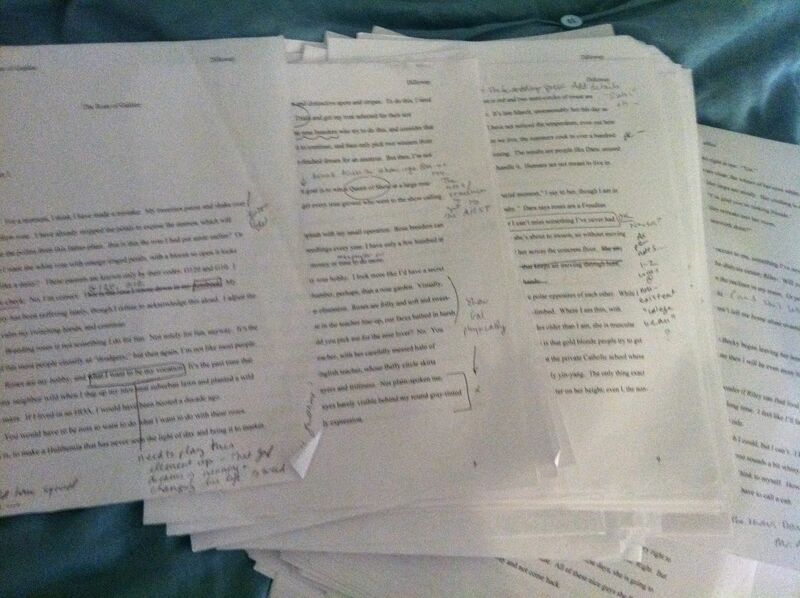 Per my editor’s guidelines, I trimmed about 30. I ignored a lot of the outline. It didn’t feel right. The outline was more of a guideline, and it kept me on the right track, but the details changed a lot. I spent quite a bit of time NOT working on it, but thinking and daydreaming about it before I began. I believe this allowed me to work out quite a few kinks in my head before I ever tried to write anything. While I wrote, I circled back BEFORE I finished the first draft to make some changes to the beginning, so the ending will make more sense. This is in contrast to some popular advice, which is to write the whole draft without stopping, beginning to end. Will I write like this every time? I don’t know. Maybe it will be different for each book. Maybe I have discovered the thing that works for me. We shall see. Do you think perhaps Housewife took longer because it was a more personal story and relied much on your mom’s history? I know sometimes things that have more of a personal or emotional connection are often harder to write or finish? Just a thought. Can’t wait for your new book! Yes, that is part of it. It was also all over the place thematically at first because I was trying to make it less personal. It even had a whole other main character that got cut out later.